Today we honored to have Laura McCarthy as our guest blogger. Laura is a first year pre-K teacher at a school in Washington DC and an Inspired Teaching Fellow. Note to secondary teachers: we can learn so much from our colleagues who work with the littlest of little people. Take a few moments to read Laura’s post and think about what it means for your classroom. This is a picture from my first field trip in my first year of teaching. I spent the morning petrified, nervous like a mother hen taking her roost away from the nest for the first time. I micromanaged the plans, planned for all contingencies, and counted heads every few seconds. Then, it came time to take a walk. 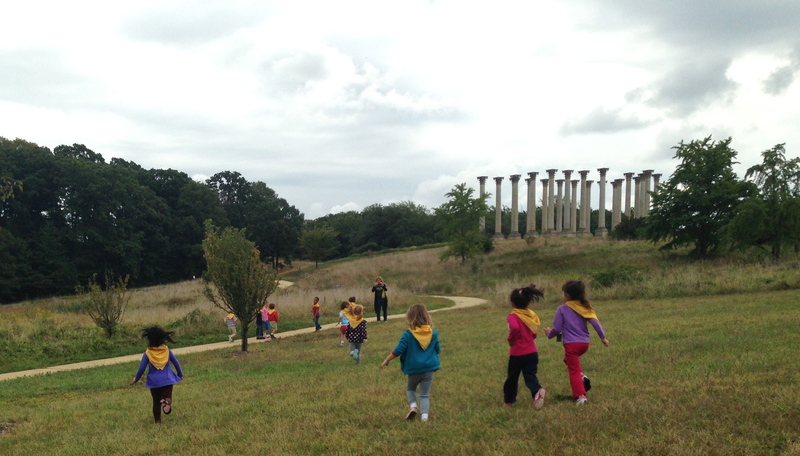 We were at the National Arboretum and needed to get from one end of the park to another in a hurry. We diligently stayed in groups as we walked along the paths. And then, we came to an expansive, open field. The art teacher (who is much more veteran and thus, braver than I) turned to the kids and simply said, “Let’s fly.” With that, she took off running with her arms spread wide, twenty gleeful four-year-olds scampering behind her. The paranoid mother hen in me grimaced. “But! How will we control them?” and other worrisome thoughts pounded through my head. Since my cozy and crammed classroom is far from comparable to an open field, I reflected on how to provide this kind of open, carefree joy in my classroom. I asked, how can I create a learning environment where kids are happy, engaged, and excited to take risks? The most important first step involves doing exactly what I was afraid to do in the field: let go of control. My goal is to help educate children into compassionate, mindful, and curious people. In order to guide them toward this type of development, I have to follow their lead. I will get nowhere by controlling, orchestrating, and planning according only to what I believe is best for kids. I need to learn their interests, discover their needs, get acquainted with their personalities, and use all of this information to plan areas of focus, form lessons, and script my language. I have to be flexible, intuitive, and be ready to think on my feet. I have to let them show me where we need to go and show me how best to get there. Once I take into account all that I learn about my students, I have the information I need set up a classroom that is fulfilling and supportive for them. I live by some guidelines and I plug students’ interests, needs, and personalities into them. I have listed them below. Include frequent movement activities– Singing, dancing, arm and hand motions, and playing games are all essential to a joyful environment. Songs help to ease transitions and can even make them fun. Fingerplays help to ground words, numbers, and concepts in a tactile and kinesthetic experience. Dancing and stretching is fun and is also the fastest way to calm and re-center a restless body. Bolster students’ sense of autonomy– The natural condition of school casts children in a subordinate role. Providing ample daily opportunities for children to make independent choices and carry out independent responsibilities helps to restore their sense of self-control and empowerment. Celebrate and enable the use of imagination– At its most basic, imagination is entertainment and escapism. But if allowed to stretch and flex their imagination muscles, children can accomplish amazing things. They can act out wild tales, write vivid stories, and create stunning art. They can take themselves on thrilling adventures and practice problem-solving skills. Imaginative play and work is fun for children, but also helps them build critical thinking skills that serve them in their literacy, artistic, and even scientific and mathematic development. Let kids feel- Teach and coach empathy. Explore all emotions and make space for experiencing them in the classroom. Let kids know there’s no such thing as a wrong feeling and help them to learn appropriate ways for expressing and processing emotions. Part of creating a joyful environment means establishing a classroom culture in which children feel safe to feel all the things that they feel. Turn mistakes or mis-tries into opportunities – It is scary to be wrong. It feels terrible to try something that does not work. There is shame associated with imperfection. Eradicate these negative self-reflections by creating a safe space for risk-taking. Provide endless opportunities for exploration, and trial and error. Change the language about mistakes. Instead of “wrong answers,” look at them as an opportunity for adventure, a chance to try a new path of discovery. Play. When you think about it, play occurs one way or another in all the above suggestions. Play is essential. Play is exploratory. Play is challenging. Play teaches us friendship skills. Play lets us see things from many angles. It might look different at different ages, but I assert that no classroom is complete without play. Teaching like this is not easy. It is challenging, exhausting, mind-boggling, and unpredictable. But the payoff is too good to pass up. Creating a joyful classroom instills a passion for learning and establishes a comfort with exploring the unknown. When children are happy, when they feel taken care of and feel like the room is their own, they are ready and eager to learn. My goal as an educator is to make learning like a big open field and to help students boldly run at it, arms flung open, smiles radiating. Laura is an incredible, empathetic, flexible, thoughtful, powerful, kind teacher. This is a wonderful post. Glad to be part of the journey and flying with her. How true! What a great reminder to make learning a fun, joyous experience! I am so facinated with the direction of education today. Proud that you a are part of this. Looking forward to where this new approach takes us in the future. Vested interest, my grandchildren. Love this! A joyful classroom is a room full of students who have a good – if not great – relationship with their teacher…and this is where the best learning is rooted. I can see you, the children, and that wise ol’ art teacher flying across that field – a delightful image!! Thanks for sharing.